A soak in warm, bubbly spa water can be a delight to both mind and body. That’s the goal of thousands of homeowners across the country who build a swimming pool-spa combination to enjoy. But while you, too, may crave the relaxation and hydrotherapy benefits that a spa brings—what if your home lacks the outdoor room for a full swimming pool? Did you know that you can build a stand-alone inground spa—without a swimming pool? Admittedly, a solo spa does require a major investment. However, under the right conditions, this custom-built solution may be the perfect choice for your home and outdoor setting. An inground spa constructed of concrete (gunite/shotcrete) enhances the beauty of your backyard in a way that no portable, prefabricated hot tub ever could. A concrete spa can help create a lovely, resort-like look and feel, and a well-designed project can add value to your property as well. Because it’s typically built below the ground (or with only a few inches extending above it), an inground or semi-inground spa is a better choice for those with mobility issues. Its low, ground-level position provides for easy entry into the water. Now, you could go with a factory-produced acrylic tub. They carry a lower upfront cost and are quick to install. However, these structures typically sit like unwieldy blocks above the ground. To access one, users typically need to climb up several steps into the water—making it a poor choice for those with certain physical disabilities. Above all, in a beauty contest against a concrete spa, a hot tub will never take a first-place ribbon. So, if appearance and ease of access are not key concerns, a factory-made unit might be your best bet. Above-ground models cost as little as several thousand dollars, and they don’t require an excavation or weeks-long construction schedule. However, hot tubs aren’t for everybody. If you have the budget and want to create an attractive outdoor oasis that incorporates decorative options such as a rock waterfall or distinctive masonry, opt for an inground spa. 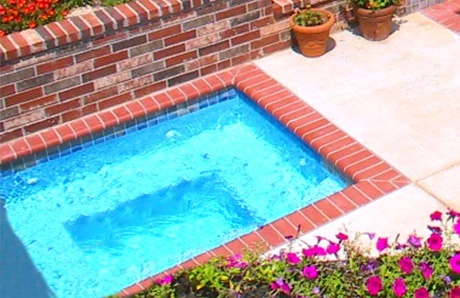 If you have limited outdoor space on your property, a swimming pool may not be an option. 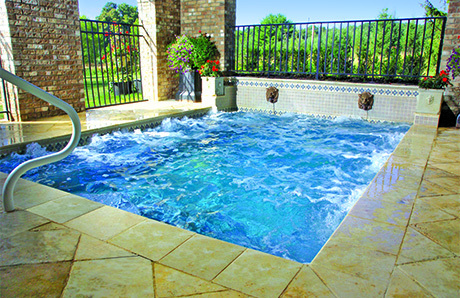 But that does not mean you cannot capture much of a pool’s good looks and aquatic features with an inground spa. A custom spa can achieve the aesthetic appearance you want and serve as a focal point for your outdoor living space. It will also provide the design foundation for accessorizing in a way that an above-ground, factory model just cannot. Your options with an inground spa start with its shape. 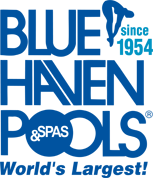 A professional pool builder can work with you on the pros and cons of various shapes and how a particular one might make the best use of limited building space. For some “in-spa-ration,” check out this photo-filled article on spa design ideas. Along with tremendous versatility of shape, a concrete spa shell allows you to dictate the exact size to fit any space restrictions and accommodate your plans for family use and backyard entertaining. Another advantage of an inground spa is its range of interior and surrounding features. For starters, you can bling out the spa’s waterline. Pick any patterned ceramic pool tile—or the increasingly popular glass tile—for eye-popping appeal. You can also include decorative coping. Coping is a distinguishing material—such as brick, flagstone, travertine, or concrete pavers—that trims the spa perimeter and visually defines its shape. Because the spa is constructed entirely or partially beneath the ground, you also can surround it with your choice of decking. Create a uniform, seamless look throughout the project setting with any hardscape material from natural wood to stamped concrete. An inground spa can also add backyard dimension with some elevation. If you’re so inspired, the design could include a spa wall that is slightly higher than the ground—in some cases, just a few inches taller; in others around 18 inches. This design approach creates an opportunity to include a short exterior spa wall that you can adorn with a distinctive tile pattern or natural stone fascia. Best of all, what makes an inground spa special is how you can include features similar to those found in custom swimming pools. For example, you can give your spa interior a distinctive appearance with a color quartz or pebble finish. To take the design to the next level of style, add a water feature such as a sleek cascade, spouting fountain, or curved jet that shoots water laminars into the spa. 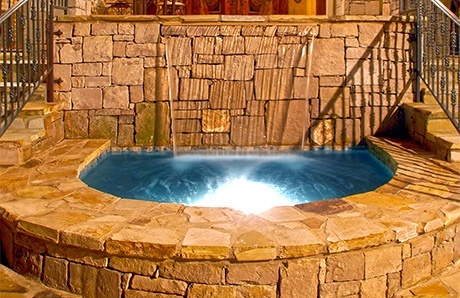 You can even build a faux or natural rock waterfall that spills into your spa. Such beauty does come with a price: Typically, the cost of building a concrete spa is comparable to the price of building a small, simple swimming pool. Yes, let’s repeat that: Pricing for a stand-alone spa runs nearly as much as a small swimming pool. An 8-foot-diameter inground spa could cost only a little less than a basic 13-by-26-foot swimming pool. Why? Because inground spa construction (discussed below) mirrors the process necessary for building an inground pool. Every building phase must be executed, and all carry a minimum price point. Think of each phase like a menu item at a restaurant. A cup of soup might be four dollars, and the bowl—which is at least twice the size—runs only six dollars. In spa and pool terms, the pricing reality is similar. For example, a plaster specialist has to come to the job site to complete the spa’s interior finish. Now, while the labor will take less time, and the amount of material will be less than it would for an entire pool, there will still be a base or minimum charge for this specialty trade to be completed. Naturally, the options you choose for your project will also impact your spa-only budget. They include the model and size of natural gas heater you include, any extra hydrotherapy jets, and automated controls to remotely operate your spa. Other decorative upgrades can include water features and upscale masonry and decking. Quenching your desire for a hot bubbly soak is quickly attainable by purchasing a pre-fab hot tub and having it delivered to set out in your yard. But if you are in sync with the aesthetic integration and entertainment-rich value that comes with a custom inground spa, know that quality takes time and higher investment. Along with the upfront price tag, here is another reason why you may decide that a spa-only build may not be for you: Building it will require every one of the same construction phases as a complete inground swimming pool—just on a smaller scale. Like concrete pool construction, building a spa begins with obtaining a construction permit. Your builder will handle this task. Next, your builder will lay out the shape, either by painting the shape on the ground or by installing wooden forms in the shape. Now the job site is ready for excavation. Either a small Bobcat or mini excavator will remove the earth, or, a manual dig will commence with shovels. Once the hole is dug, it’s time for installing rebar—steel reinforcement bars—into the open earth. The steel forms a frame for the concrete shell. Next, plumbing lines are laid. They will connect the spa equipment and accessories, such as a pump, filter, heater, hydrotherapy jets, and blower motor for the jets. Then an electrician installs the appropriate wiring and connects the power source to the equipment. If you are including automation and remote controls—a smart move to boost convenience—the electrician will install these as well. The concrete application, coupled with the steel frame, now will form the shape of the spa. A wet gunite or shotcrete mix is applied pneumatically with a high-pressure hose into the spa form. The material dries and hardens around the rebar framework for tough, lasting structure. Coping masons will then install your pick of material around the spa perimeter. The tile is neatly hand laid under the coping edge, along what will be the water line. After coping and tiling, your decking will be installed to complete the spa and unify the backyard setting. Now comes the final phase: A specialist will apply the interior finish to your spa. Often referred to as plaster, the finish has multiple purposes—it makes the interior smooth, waterproofs the concrete shell, and makes the interior particularly attractive. Three kinds of finish are available: traditional marcite plaster and two upgraded materials, color pebble and color quartz aggregate. Again, although a spa is much smaller than a pool, it will not take significantly less time to build. Because the steps are essentially identical to those needed for a pool, the spa construction timeline is almost the same as a small, simple pool. However, the work leads to a rewarding conclusion—a handsome addition that enhances the beauty, ambiance, and functionality of your home’s exterior space. When choosing what kind of spa to add to your backyard, consider how quickly you want it ready for use, what your budget is, how you want a backyard retreat to look, and what ambiance it should help evoke. With an inground spa, you can make it any size and shape, and create any design. 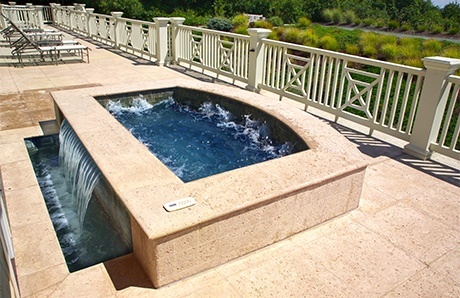 Inground spas offer the ability to incorporate a wide variety of backyard decor and themes seamlessly. Your spa can be flush with the ground or slightly elevated for extra visual drama. And you can integrate dazzling water features or custom rockwork. An acrylic unit from a factory just cannot match a concrete spa’s beauty and ability to enhance the visual appeal of your outdoor setting. You can’t build an inground spa overnight—but once you do, it will provide quality and luxury that can be enjoyed by family and friends for many years to come.